JERUSALEM (CNN) -- Israel has expelled Venezuela's ambassador in response to Venezuela's expulsion of an Israeli envoy and the rupture of diplomatic relations earlier this month. 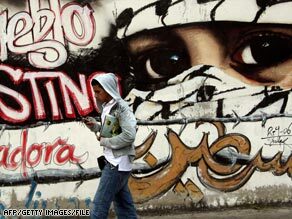 A pro-Palestinian mural in the Venezuelan capital, Caracas. Venezuelan head of mission Roland Betancourt and two other diplomats were given until Friday to leave. "Due to the decision of Venezuela to cut relations with us a few weeks ago, we told the Venezuelan charge d'affaires that he and his staff should leave Israel," Foreign Ministry official Lior Hayat said. "We told them they are declared persona non grata in Israel." Venezuela expelled Israeli Ambassador Shlomo Cohen and staff on January 6 and broke off diplomatic relations on January 14 in protest of Israel's attack on Gaza. Bolivia also broke off relations with Israel that day. Venezuelan Foreign Minister Nicolas Maduro defended his country's actions, saying Israel violated basic human rights with its military action. "Our decisions were just, correct, aligned with and adjusted with the spirit of our constitution, which mandates that we seek international peace," Maduro said in a statement on the foreign ministry's Web site. Maduro said Venezuela's actions are compatible with its support for the creation of a Palestinian state. He has not spoken, he said, with any Israeli officials over this week's expulsion of the Venezuelan diplomats. "The response of the state of Israel is weak, late, and in any case for us it's an honor," Maduro told the Qatar-based television network Al-Jazeera. "We're proud that the state of Israel that exists today, led by these criminals, made this decision." Israel and Venezuela have had diplomatic tensions before. Israel recalled its ambassador to Venezuela in August 2006 "in protest against the one-sided policy of the president of Venezuela, Hugo Chavez, in light of his outrageous defamatory remarks against the state of Israel, and in reaction to the recalling of the Venezuela ambassador to Israel," the foreign ministry said at the time. A January 21 cease-fire put an end to fighting between Hamas militants in Gaza and Israel, which had launched a three-week offensive, saying its goal was to stop missile strikes into southern Israel. More than 1,200 Palestinians, many of them civilians, were killed. Israel lost about 10 soldiers and three civilians.